Objective: To provide a more detailed anatomical and clinical application basis for digital artery perforator flaps of the middle phalange. Methods: 5 ten adult cadaveric (10 hand specimens) hand specimens from adult cadavers hand specimens were used chosen from December 2012 to March 2013. The dorsal branches of middle phalange digital artery and arterialy area of the index finger, middle finger, ring finger, and little finger were observed with microanatomically by under microscopically. Images were obtained taking pictures with a high-resolution camera, measurement and analysis of the with PhotoshopCS4 software, the branch point position, angle, length, number of small branches, and anastomoses were observed, and observed data was gotten. Results: The starting point mean outer diameter of dorsal branches of the middle phalange digital artery of index finger, middle finger, ring finger, and little finger was ≥ 0.30 mm, and the end mean outer diameter was ≥ 0.20 mm. The starting point mean outer diameter of the little finger was ≥ 0.25 mm, and the end mean outer diameter was ≥ 0.10 mm. There were 2-5 small branches, with a 53.5 ± 10.5º mean arterial angle. Conclusion: Flap retrograde or antegrade anatomical structures of middle phalange digital artery’s dorsal branches were fixed, easy, and fast to operate. This method appears ideal to repair the digital dorsal defect of proximal interphalangeal joints, finger pulp defect of the middle phalange, and fingertip and pulp defect of the distal phalange. Four branches of the dorsal skin branch vessels that were consistently thick were led from the proximal segment and the median segment thereof along with the proper digital artery and positioned at the middle segment and distal one-third segment of the proximal phalanx of the finger, the middle segment of the middle phalanx, and the horizontal place of distal interphalangeal joint, respectively. The digital arteries on the radioulnar side of the dorsal skin branch were symmetrical, and the starting point of the dorsal skin branch was relatively constant, with little discrepancy [1-5]. The perforator artery of the median segment of the dorsal branches was one of four thick perforators of the dorsal branches of the digital proper artery; it was considered in the general anatomy view that this branch did not have a main vessel, and the vasoganglion chain structure was formed by the dorsal outer edge and other branches of fingertip artery after branching from the fingertip artery . Considering the existing literature and relevant reports, it is difficult to find detailed anatomical data about anterograde and retrograde perforator flaps with the dorsal branch of the median segment of the digital artery’s middle phalanx as the peduncle. 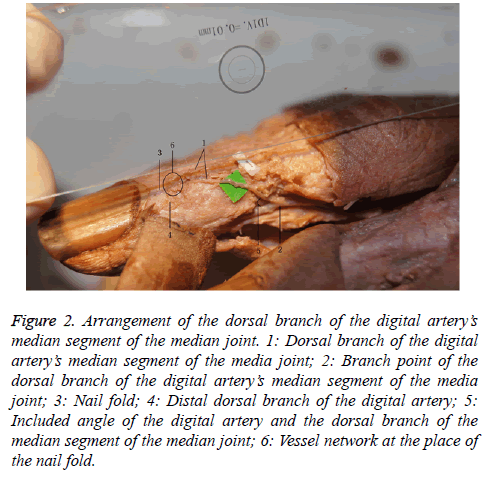 This study was designed to observe the adult cadaver hand specimen fixed in 5% formalin after microdissection (in absence of irrigation), measure, and record relevant anatomical data of the median segment’s dorsal vessel branch of the median joint of the digital artery by taking into account the first reported clinical application. In this case, the soft-tissue defect of the proximal finger joint was successfully restored in February 2009, by means of anterograde perforators flap, taking the dorsal branch of the median segment of the median joint as the peduncle to set up the relatively detailed theoretical basis for cutting the flap by taking the median segment’s dorsal vessel branch of the median joint of the digital artery as the peduncle. We used 5 adult cadaveric (10 hand specimens) (6 male and 4 female; 40 fingers including the index fingers, the middle fingers, the ring fingers, and the fifth fingers), from donors whose age at death ranged from 34 to 69 y. The major equipment we used includes 1:0.01 mm micrometer, 16.8 mega-pixel digital SLR camera, microinstrument, operating microscope, etc. Preparation of specimen: selection of specimen: We surgically excised 10 adult cadaveric hand specimens, which are well preserved and fixed in 5% formalin, until the radial and ulnar joints of the wrist; malformed specimens, those with visible scars due to wound, and those with flexion defects of the finger joint were avoided. Treatment of specimen: The specimens were cleaned with bristles, and the dirt on the surface of the specimens was rinsed with saline. Next, the specimens were soaked in cadaver preservation solution for one week. The spare specimen was fixed on the worktable with palm facing downward and the dorsal part of the specimen facing upward. All dorsal skin was carefully peeled off the fingers from the metacarpophalangeal joints to the nail roots under the 10-time operating microscope by hand-held surgical microinstruments to expose the tissues of dorsal fascia of the finger. The proper digital artery on the radioulnar side of the median joint of the finger was exposed and the median joint was fixed. Then, the branch point of the thick and big dorsal branch was taken as the starting point to peel off tissues of the surrounding fascia along the direction of the vessel to expose the whole anastomosis site of the vessel branch and the ending point. After observing the anastomosis and direction of the branch vessel under the microscope, the specimen was dissected under the 1:0.01 micrometer on the identical plane, and images were obtained vertically with the 16.8 mega-pixel digital camera. Further, the direction of the branch vessel and anastomosis condition was observed by means of Photoshop CS4 software. The following were measured: the outer diameters of the starting points and ending points of the dorsal branch vessels of the median joints of the digital arteries of 2-5 fingers, locations of the branch points, lengths from the starting points and ending points, number of small branches, and the angles of the digital arteries. All data are represented as mean ± standard deviation after appropriate statistical analysis. Two to four dorsal branch vessels that are distributed symmetrically and equally are formed from the digital artery on the radial side and ulnar side of the median joint of the finger. The study statistics of 40 fingers and 80 sides indicated that four branches arose on the 10th finger and 20th side of the index finger; 4 branches arose on the 10th finger and 20th side of the middle finger; 3 branches arose on the 2nd finger and 4th side of the ring finger; 4 branches arose on the 8th finger and 16th side; 2 branches arose on the 1st finger and 2nd side of the fifth finger; 3 branches arose on the 3rd finger and 6th side; and 4 branches arose on the 6th finger and 12th side. One dorsal branch vessel was significantly thicker than other branches in the area of the median joint along the digital artery after comparison and analysis, in accordance with the observation data of the outer diameters of all branches, wherein the branch vessel is positioned at the midpoint of the middle phalanx. The deviation of the locations of the fingers is 0.3 mm and below. The position of the vessel was as follows: the vessel symmetrically occurred on the 10th finger and 20th side of the middle finger and; the vessel symmetrically occurred on the 9th finger and 18th side of the middle finger; the vessel symmetrically occurred on the 10th finger and 20th side of the ring finger; the vessel symmetrically occurred on the 8th finger and 16th side of the fifth finger. Furthermore, the occurrence rates of the dorsal thick vessels of the median segments of the median joints of the digital arteries of the index finger, the middle finger, the ring finger, and the fifth finger are 100%, 100%, 90%, and 80%, respectively (Figure 1). Figure 1: Occurrence rates of the dorsal thick vessels of the median segments of the median joints of the digital arteries of the index finger, the middle finger, the ring finger and the fifth finger. The statistical analysis after observation of the median segment’s dorsal perforator vessel of the digital artery’s median joint showed the following: 1. the average outer diameters of the starting points of the index finger, middle finger, and ring finger were ≥ 0.30 mm, while the average outer diameters of the ending points were ≥ 0.20 mm. The average outer diameter of the starting point of the fifth finger was ≥ 0.25 mm, and the average outer diameter of the ending point was ≥ 0.10 mm. The angle with the digital artery was 52.48 ± 8.29º (Table 1). 2. This vessel was relatively straight, located aslant to point to middle-distal direction of the finger back, and ended at a location that was one-third of the inner part of the nail fold (Figure 1). 3. The vessel at the ending place was matched with the identical vessel on the opposite side and the dorsal distal joint branches of the digital arteries on two sides, thereby forming a “π”-shaped vessel net structure (Figure 1). 4. This vessel tapered gradually from the proximal to the distal end, and the length thereof was the distance from the median segment (branch point of the digital artery) to the location that was one-third of the inner part of the nail fold. 5. Multiple small branches were arranged towards the surrounding tissues on both sides of the vessel, wherein 4-5 small branches arose on the index finger and the middle finger; 3-5 small branches arose on the ring finger, and 2-4 small branches arose on the fifth finger. All small branches lay in the proximal to distal direction: the first branches were arranged toward the dorsal side of the proximal finger joint reversely to match with the vessel net on the dorsal side of the proximal finger joint; the other small branches were arranged aslant toward the distal end to enter into the dorsal digital aponeurosis and the surrounding fascia tissue or to match with the identical vessel on the opposite side. 6. The occurrence of the vessel branches on the ulnar and radial sides of all fingers, outer diameters of the starting and ending points, locations of the branch points, lengths of the starting and ending points, number of small branches, and the angles with the digital artery corresponded with each other, without significant difference in accordance with the anatomy experiment. Table 1. Outer diameters of the starting and ending points of the dorsal cutaneous branches of the index, middle, ring, and fifth fingers’ median segment of the median joint and angle with the digital artery. Our anatomical study showed that the occurrence rates of the vessel branches on the radial and ulnar side of all fingers, outer diameters of the starting and ending points, locations of the branch points, lengths from the starting and ending points, number of small branches, and the angle with the digital artery corresponded with each other, without any significant difference. Our results agreed well with existing literature [7-9], which states: the dorsal vessel perforators of the proper digital artery were relatively constant at the starting locations of all joints and segments, the digital arteries on the radial side and the ulnar side arose symmetrically. We considered that the flap encompassing this branch as the vessel peduncle was universal, because the outer diameter at the starting point of the dorsal branch of the digital artery’s median segment of the median joint was considerable and the occurrence rates of all fingers were high and constant. We considered that the different arrangements are directly related to selection of the specimens and manufacturing method. Hand-vessel specimens can be prepared as follows: selecting fresh specimens and cleaning the blood in the lumen with different rinsing agents; pressurizing and infusing with stationary liquids or developing agents; dissecting or shooting with the help of X-ray. We considered that the dissection and observation might be affected because the above-mentioned factors alter the primary and secondary levels of the vessel branches. Formalin-fixed adult cadaver specimens, as in this study, should be checked for visible scarring due to wounds, malformation, defects in finger-joint flexion. The specimens should be soaked in cadaver preservation solution for one week in order to restore the elasticity and tension of the vessel, skin, and loose connective tissue. The specimens should be directly dissected under the microscope along the direction of the thick constant dorsal branches of the digital artery’s median segment of the median joint when no infusion condition is available. Although this method is time-consuming and has significant operating challenges, the former dissection structure relationship of the specimens’ vessels can be remained excellently. Moreover, we considered that the real dissection structure relationship of the small vessels could be observed more accurately during dissection by selecting the material and handling the specimens. Our dissection data suggested that the ending point thereof was positioned at a location that was at one-third of the inner part of the proximal edge of the nail fold, wherein the average outer diameters of the index, middle, and ring fingers were ≥ 0.20 mm, and the average outer diameter of the fifth finger was ≥ 0.10 mm. To our best knowledge, there is no relevant report in the existing literature about measurement of the outer diameter at the ending point, because our results on the arrangement of the dorsal vessel perforator of the digital artery in the median segment of the median joint are different. Blood supplied for the flap within a small area can be loaded when the ending point is taken as the rotating point of the flap, because the diameter of the vessel is relatively thick. We believe that the important theoretical basis was obtained from this result to cut the retrograde flap of the digital artery’s median segment of the median joint; the mean value (53.5 ± 10.5º) of all fingers was acquired by measuring the angle formed by the dorsal branch of the digital artery’s median segment of the median joint. Moreover, we considered that the basis was provided by this measuring result for designing of the flap on the dorsal side in the finger’s median segment of the median joint. We designed the flap by including the vessel perforator as per our results. We implemented anterograde cutting by taking the part from the center of the transverse striation connecting line beside the finger of the middle phalanx to the place which is one-third of the inner part of the nail fold on the identical side, and implemented retrograde cutting by taking the center of the transverse striation connecting line beside the finger of the middle phalanx as the rotating point. Further, we repaired defects of the finger pulp of the distal phalanx with a maximum area of 1.5 cm × 2.5 cm, finger pulp of the median joint of the distal phalanx, and the skin and bone defects of the proximal joint by selecting the location that was one-third of the inner part of the proximal edge of the nail fold as the rotating point. The cutting was implemented after exposing the dorsal branch point on the side of the finger in the median joint along the digital artery, wherein the peduncle was controlled at 0.4~0.6 cm wide; and the rotating and twisting angles of the flap were 180º and lower. Our results suggested that the dorsal perforator vessel of the digital artery has the following advantages: 1. As the procedure is completed on the wounded finger, the adjacent tissue of the wounded finger would be undamaged. 2. The dorsal skin of the median joint of the finger is taken as the donor area of the flap; therefore, the activities of the proximal joint would be unaffected. 3. Blood is supplied to the flap by means of a thick vessel branch, and the operation has a high success rate. 4. The flap is featured with high quality; the dorsal skin of the finger has excellent wear resistance; no subcutaneous fat will occur; and the flap would not be swollen after operation. 5. The second pedicle division is required in the traditional operation, for example, the adjacent finger flap and the thenar flap ; cutting of the flap can be completed in one step during application compared with the traditional application. Therefore, the therapeutic course can be obviously shortened and the economic burden and psychological harm reduced. 6. The major vessels of the finger would not be injured during the operation, as the joint is not required to cross over. Further, early functional training can be implemented; joint stiffness due to a damaged digital artery on one side because of traditional surgery such as the digital arterial flap can be avoided, as the incision in these cases is required to cross over the proximal and distal interphalangeal joints [11-15]. The dorsal vessel perforator branch of the digital artery in the median segment of the median joint was arranged toward the distal joint; one-third part of the inner part of the nail fold corresponded with the identical vessel on the opposite side and the distal dorsal branches of the digital arteries on two sides, thereby forming an approximate “π”-shaped vessel network structure. This dorsal branch was the trunk perforator vessel that passed through the median joint and distal finger, had large starting and ending outer diameters, and was arranged in a straight fashion. Blood supply to the flap was from the matched blood network of the constantly thick dorsal branch of the median joint and the distal dorsal branch of the digital artery (Figure 2). Figure 2: Arrangement of the dorsal branch of the digital artery’s median segment of the median joint. 1: Dorsal branch of the digital artery’s median segment of the media joint; 2: Branch point of the dorsal branch of the digital artery’s median segment of the media joint; 3: Nail fold; 4: Distal dorsal branch of the digital artery; 5: Included angle of the digital artery and the dorsal branch of the median segment of the median joint; 6: Vessel network at the place of the nail fold. Haren berg PS, Jakubietz RG, Jakubietz MG. Reconstruction of the thumb tip using palmar neurovascular flaps. J Oper Orthop Traumatol 2012; 24: 116. Braga Silva J, Kuyven CR, Fallopa F. An anatomical study of the dorsal cutaneous branches of the digital arteries. J Hand Surg Br 2002; 27: 577. Berish S, Wilson de Moura NY. Arterial system of the fingers. J Hand Surg 1990; 15: 148-154. Bene MD, Petrolati M, Raimondi P. Reverse dorsal digital island flap. J Plast Reconstr Surg 1994; 93: 552-557. Endo T, Kojima T, Hirase Y. Vascular anatomy of the finger dorsum and a new idea for coverage of the finger pulp defect that restores sensation. J Hand Surg 1992; 17: 927-932. Xie S, Tang J, Tao K. Applied anatomy of retrograde metacarpophalangeal dorsal fascia flap taking dorsal branch of proper digital artery as peduncle. Chinese J Clin Anat 2010; 28: 97-99. Koshima I, Urushibara K, Fukuda N. Digital artery perforator flaps for finger reconstructions. Plast Reconstr Surg 2006; 118: 1579. Xue J, Fan H, Chen H. Repairing of fascia pedicel flap of distal dorsal branch of digital artery of middle finger. J Clin Med Pract 2014; 18: 106-107. Wei Z. Discussion of naming method of flap. China J Inj Rep Wound Heal 2011; 6: 337-341. Zhu Q, Zheng W, Wu J. Clinic application of island flaps of distal dorsal branch of digital artery in repairing of fingertip defects. China J Inj RepWound Heal 2010; 5: 393-396. Stang F, Rab M, van Schoonhoven J. The dorsal flag flap for skin coverage of finger and thumb-tip injuries. Oper Orthop Traumatol 2008; 20: 221. Zeng L, Hou Q, Wu G. Application of artificial bilayer dermis in repairing nail bed defect of digit tip. Chinese J Plast Surg 2013; 29: 225. Wu R. Analysis of therapeutic effect of retrograde fascia flap of dorsal branch of digital artery after repairing defects of median and distal joints of finger. Guide China Med 2013; 11: 359-360. Tonkin MA. Pollicization for congenital thumb aplasia using the second dorsal metacarpal artery as the vascular pedicle: case report. J Hand Surg (Am) 2011; 36: 502-506. Chen C, Zhang X, Shao X. Treatment of thumb tip degloving in jury using the modified first dorsal metacarpal artery lap. J Hand Surg (Am) 2010; 35: 1663-1670.